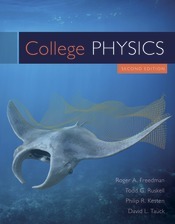 Freedman College Physics, Second Edition, is a student-centered text and homework program for introductory, algebra-based physics courses. With a focus on conceptual understanding and biological applications, College Physics makes the relevance of physics clear to students. The Sapling Plus system combines the heavily researched FlipIt Physics prelectures (derived from smartPhysics) with a robust homework system, in which every problem has targeted feedback, a hint, and a fully worked and explained solution. This new integrated learning system brings together a ground-breaking media program with an innovative text presentation of algebra-based Physics. An experienced author team brings together a unique set of expertise and perspectives to help students master concepts and succeed in developing problem-solving skills necessary for College Physics. Now available for the first time with Sapling Plus--an online learning platform that combines the heavily research based FlipItPhysics prelectures (derived from smartPhysics) with the robust Sapling homework system, in which every problem has targeted feedback, hints, and a fully worked and explained solution. This HTML5 platform gives students the ability to actively read with a fully interactive ebook, watch pre-lecture videos and work or review problems with a mobile accessible learning experience. Integration is available with Learning Management Systems to provide single sign on and grade-sync capabilities and compatible with the iClicker 2 and other classroom response systems to provide a seamless full course experience for you and your students.